Animals come to ARK for a variety of reasons. From spring to summer in particular, we are inundated with requests to take in kittens. It's said that kittens learn socialization skills between 3 and 8 weeks of age. One important part of our job is to socialize kittens around this age so that they can live stress-free lives alongside people. Some kittens who were born to stray cats and have inherited their parents' temperament can be very wary and aggressive. 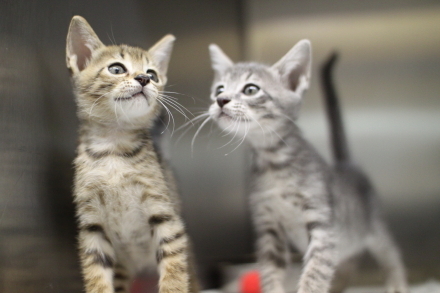 If someone is nearby, these kittens get scared of being in such close confinement. 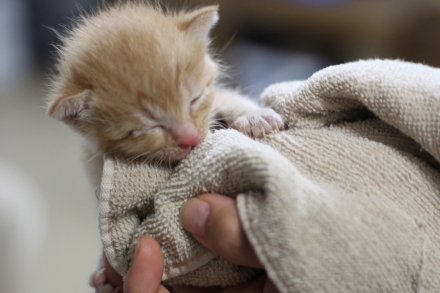 We give the kittens plenty of different experiences and we pet them as often as we can. If we’re working on other things we’ll often hold them on our laps, have someone they are unfamiliar with play with them, or take them to rooms they’ve not been to before. All the staff try to find time in between tasks to help socialize the kittens. They get along with the staff assigned to them, but if they show fear when they're moved to a different room or if they hide from someone they don't know, then it's very difficult to find them a home. Our goal is not for them to spend their lives at ARK but to find their own special family. We want them all to have a happy ending. 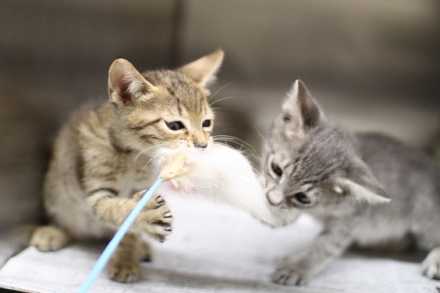 Many kittens who are already past the age of socialization come to ARK. They will hide when people come to see them. Some won't allow us to trim their claws or give them medical treatment, or will become upset when we pet them on certain parts of their body. 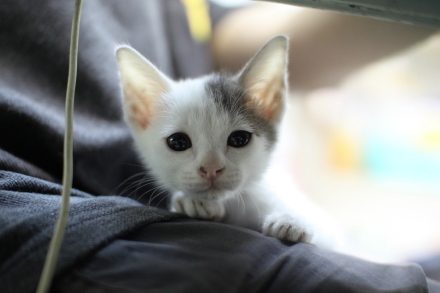 Despite the guarantee of food and safety, some kittens remain scared when people call out to them or come close to them wondering what will happen, and these kittens struggle to lead happy lives. 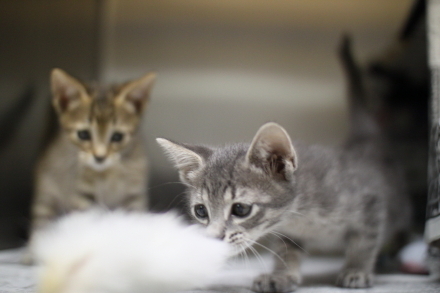 We want to give the kittens as many experiences as possible so that they can grow up to be friendly cats who trust people and who'll be able to leave ARK for happy homes as soon as possible! Place: Concourse of Hankyu Dentetsu Umeda Station in between the Big Man (large-screen TV) and the Kinokuniya bookstore. 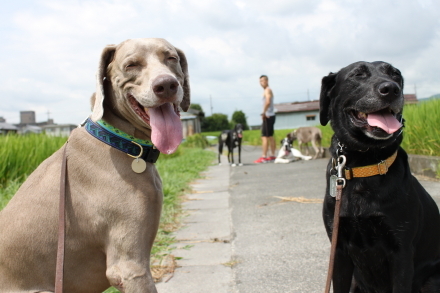 The black lab on the right is old lady Michiru from KK's house. 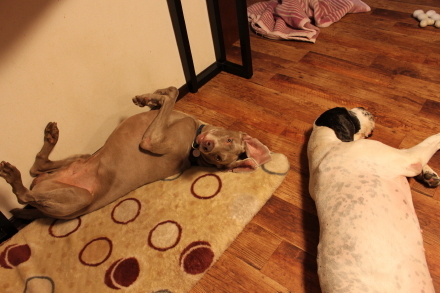 But is that Weimaraner on the left Rega from KK's house? No - Rega has fallen in with an evil organization led by that man jogging with dogs in the background. Perhaps you'd already noticed, but it's Ardbeg, a new disciple at KK's house. 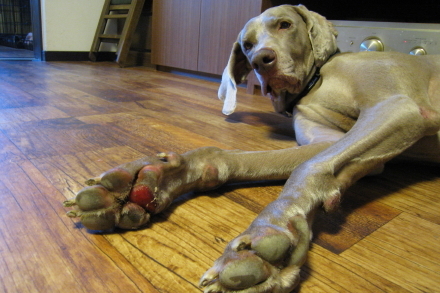 ARK was consulted about him, but there were no openings in the dog enclosures and the capacity for dogs had been reached, so he went to KK's house. Sensitive and delicate dogs like Ard-kun aren't very well suited to the group life at ARK, anyway, and often feel poorly or develop problem behaviors. There was the problem of "What will I do if he doesn't get on with my own dogs?" but I had to give him a chance based on information from his previous owner. At first, he couldn't keep up on walks, his paw pads got all scratched up, and he growled about how much he didn't trust us. 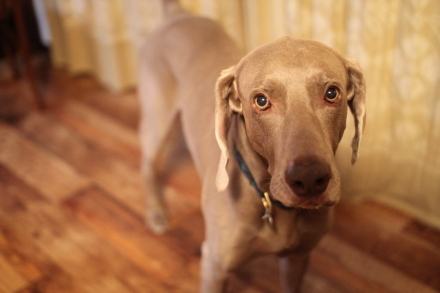 He was beloved in his former home, but he was also spoiled, so he's very stubborn when he doesn't get his way; barking and pushing, and when he doesn't like something, he growls and bites to resist it. 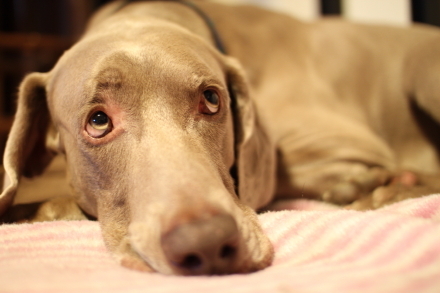 He's lived like that for eight years, so he was perplexed that we don't give in to him. A month has passed since he came to our house. Vaccinations and neutering are finally over, and he's settled down mentally. The photo shows him doing his customary snaky dance, which he does after walks or when he's in a good mood. He has funny, human-like mannerisms, and despite being an old dog he seeks affection; when he looks at me with his adorable eyes, I almost give in and spoil him, but I must take hold of myself and help him regain his dogginess, so he can live happily with a new family. It's hard to find someone who will adopt an 8-year-old large breed dog, but I believe he can find a new life. He has that right and he has a chance. 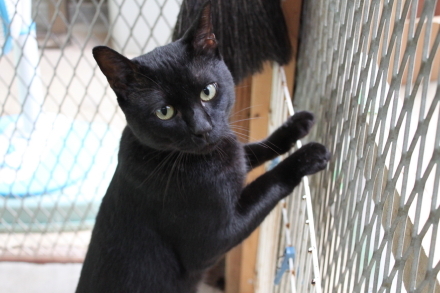 Kaka is very affectionate baby who loves to play with toys. His meow is so adorable, and he is a great black cat for someone who has never had a cat before. Unfortunately not all cats that are rescued get along with each other and live in harmony. Each cat has a different personality, and it also depends on the size of the room, location, and how many are living in one room. But there must be someone who will get along well with Kaka, right, Jun? 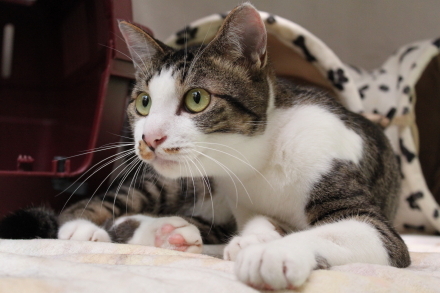 Jun is an 8-month-old boy who grew up as the only cat in the home of his rescuer. 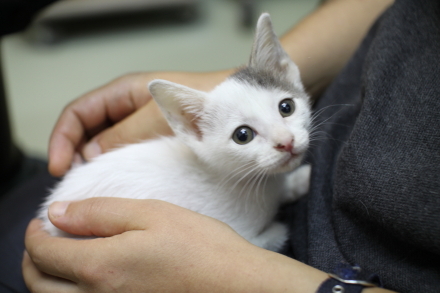 He spent his first week at ARK being all nervous, however, he adapted to his new environment well and he also learned how to communicate with other kittens. He’s not so great at communicating but he does his best. So this time Jun was chosen to be the big brother for Kaka. And it has been going pretty well. Oh, time for our meal. These two boys have hearty appetites. 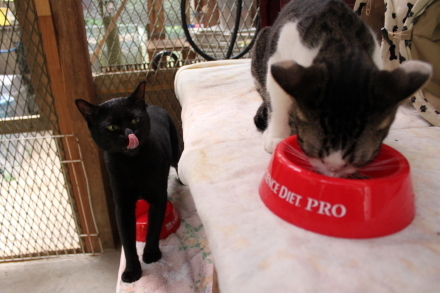 Kaka eats faster than Jun, so we add water to Kaka’s food to slow his pace down. 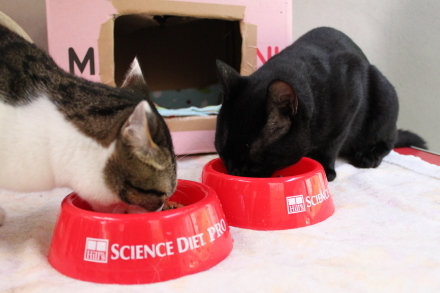 It is also a good idea to add water to the food of cats who do not drink enough water. Hey, you still have some left! If you’re going to try to eat Jun’s food then you have to eat yours over there! 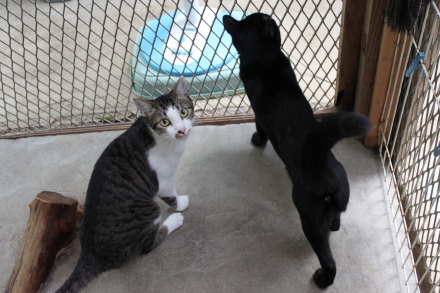 On Saturday August 7th, an adoption fair took place at GEORGE Osaka. This is a report about how it went. GEORGE is a pet shop that doesn't sell live animals, but rather products that help families with dogs and cats to have an even happier life. Their branch in Komazawa, Tokyo has been a huge help since Tokyo ARK was founded, letting us borrow space in their store, among other things. This new GEORGE store opened in Osaka in June. It's located in Higobashi, on the north side of Utsubo Park. But, but, but, even though this should have been our memorable first adoption fair at GEORGE, ARK was incredibly late bringing the dogs. Due to holiday traffic, the roads were really congested, and we were totally stuck in it. We're so very sorry for making the staff at GEORGE wait for us and for the visitors who were put out by our lateness. 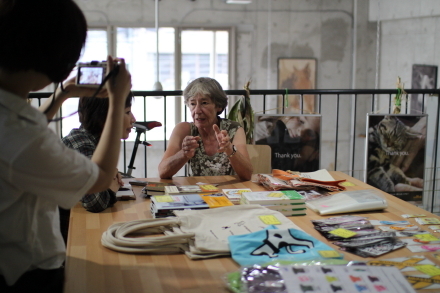 Truthfully, the impetus for this adoption fair and its main purpose was for Hobo Nikkan newspaper to interview Ms. Oliver. As for why ARK had to meet Hobo Nikkan at GEORGE for the interview, and not Nose, I won't say just yet. Please wait a little longer. It's a surprise! Well then, let me introduce the dogs that took part in the event. Jonquil, Baby Blue, and Bronze Lulu were three small dogs rescued from a breeder. In downtown Osaka, on the city streets, and in the store, they didn't seem afraid or panicky, but were well-behaved and seemed to be enjoying their outing. They cuddled with the visitors and ate the treats they were given. Rosalind was rescued from a home where the owner didn't have the animals spayed and didn't quite realize how much they would multiply. Although there were a lot of people gathered around Rosa, she didn't come over all shy and was energetically enjoying the adoption fair. Rosa is still a puppy and, depending on her mood, she’ll suddenly switch between barking guard dog mode and, seemingly tired out, falling asleep under a chair mode. Some of the dogs previously adopted from ARK came out to play too. Ruby-chan and Leon-kun from the large-scale Chihuahua rescue came along, as did the pair of Akita buddies, Hijiki and Tsururi, who also came to visit us at ARK the day before. And a graduate of KK's training center, Hino-chan, also stopped by. Being able to see the dogs' happy faces and hear about their lives from their adoptive families makes us so happy. Perhaps you bought something at GEORGE? He gazed at the store downstairs with a lot of interest, greeted people coming up the stairs, behaved well with everyone and calmly enjoyed the adoption fair. 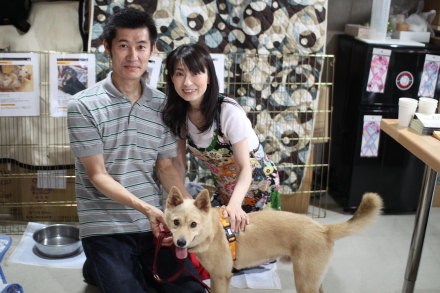 By behaving as he did, Awaji-kun was able to find a new mom and dad!! He's already become one of the family. His new family says he lies and waits in front of the bathroom for them to come out. Awaji-kun, we hope you will be happy forever!! This was a really happy omen to mark the beginning of our adoption fairs at GEORGE. From here on out, we'll be having regular adoption fairs there, so we hope to see you at one of them.